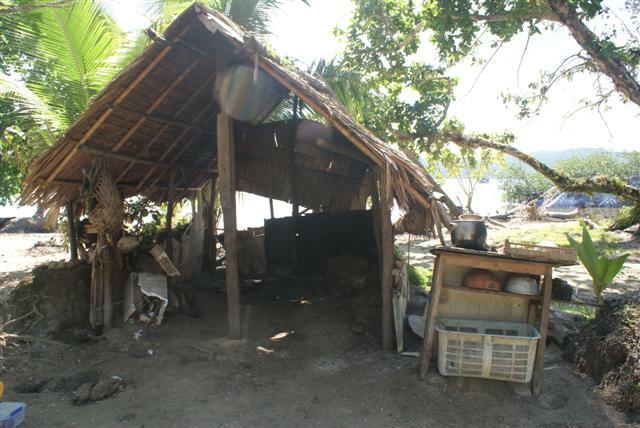 This is Bill’s last blog on the Solomons. On the 28th September it was with little regret that we left Honiara port. We headed out towards Rodrick Bay in the Florida group of islands about 28 miles to the North. 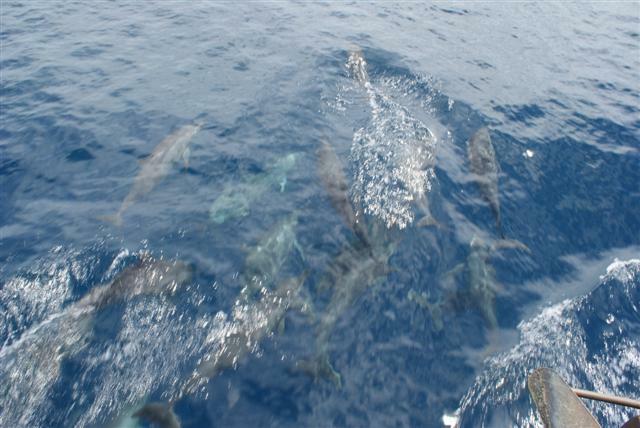 Motoring until the heat of the sun struck up a sea breeze we ploughed through the biggest pod of dolphins we have ever seen. The water was thick with them. Soon the sails were unfurled and we were creaming along for 2 hours with a fresh breeze on our beam. Approaching the bay the wind dropped as we slipped into the lee of the land under the cooling cloud cover overhead. The 33’ yacht Tomboy with Janice and Tom on board was already in the anchorage and Tom, rowing from the shore in his dinghy, helped David and Nathanial in their dugout canoe make Camomile fast to buoys fore and aft not far from the shore. Looking down into the 20 metre depth of crystal clear water I could clearly see the coral growth on the bottom and was glad not to have my anchor down there in it. David, the son of one of the three brothers at the head of the extended village family, explained that we were welcome to use the buoys at no charge for as long as we wanted. We were also welcome to come ashore, swim, snorkel and generally roam around. We had been impressed by the wreck of a cruise ship beached on the shallow reefs close to the shore. This had apparently been holed and was sinking but managed to disembark her passengers before being beached to save her for salvage. 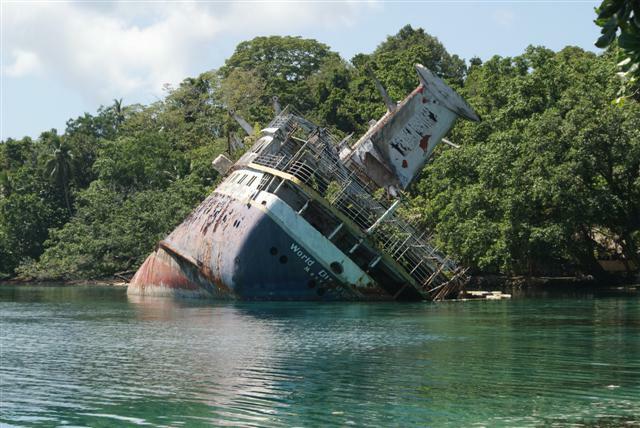 David explained that the local chief of the next village had claimed her, after he had repelled attempts to salvage the vessel, and he now charges a fee to visit the slowly rusting hulk. Needless to say, pilfered bits of cruise liner showed up throughout the villages in the bay. This vanity unit was being used as a work top. Very soon this diminutive, doughty and eloquent lady who brought us a gift of shells and fruit visited us. She explained that they liked to welcome newcomers with what we would call a “pot luck” dinner and would we like to come ashore tomorrow evening to meet the whole family. Even from the boat we could see that this village was tidy and well looked after but even more primitive than anything we had come across to date. This is Lillian’s kitchen which has an open fire in the corner. 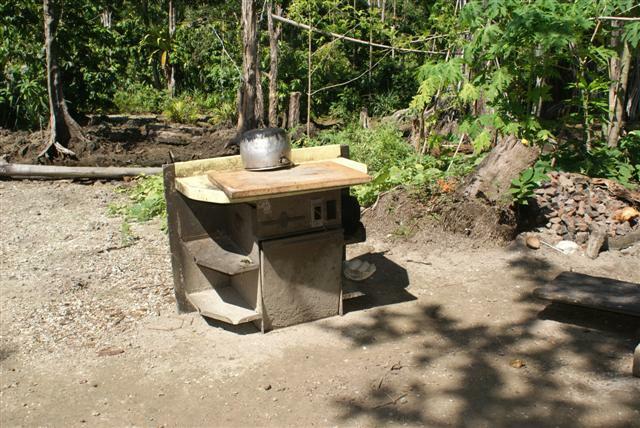 The fire serves two purposes, it has a large cooking pot over it for boiling vegetables but also rocks are heated in the fire which in turn are used to form an oven to roast fish or veggies (they rarely have meat) covered with old sacking and banana leaves. Tom and Janice came on board for drinks that afternoon and we chatted about their time here. It turned out that Janice, although a vet, was running a free clinic for the local tribes and Tom was teaching various subjects to some of the local children. Their selfless generosity was humbling and makes you realize that the more people like this we have on the planet the better the place becomes. I was embarrassed, though grateful, when Janice insisted on treating my knee injury that had recently flared up. She introduced me to something she called acupressure, a treatment manipulating pressure points, which she explained, controlled the flow of energies through the body. Decades of cynicism dropped away as the treatment started to relieve the painful symptoms but I still felt a bit of a fraud because, compared to the ailments she was seeing at the clinic, mine was trivial. The following afternoon Sue made a large chili-con-carne with rice on Camomile and Tomboy prepared a huge pasta dish and a banana cake all of which was ferried ashore at the appointed hour. I was bowled over by the preparations that the villagers had been making during the day. 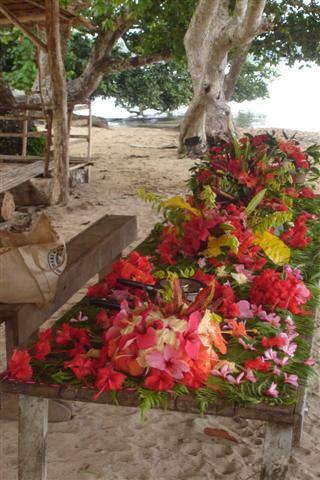 Every inch of the huge table under the palm fronded roof was covered in brightly coloured hibiscus petals and leaves. 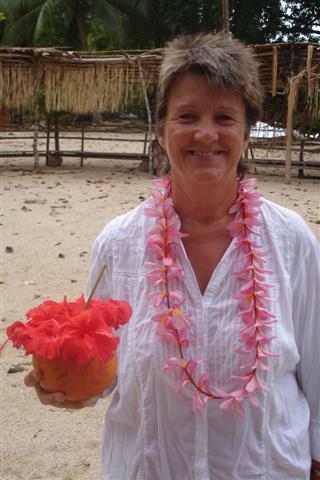 Sue decorated with the beautiful flower garland and the decorated drinking coconut. The ladies presented us with beautiful garlands and offered us green coconuts decorated with petals and fine bamboo straws to drink the fresh coconut milk. The men had been out fishing in the lagoon, returning with clams for the chowder starter and reef fish for the main course. 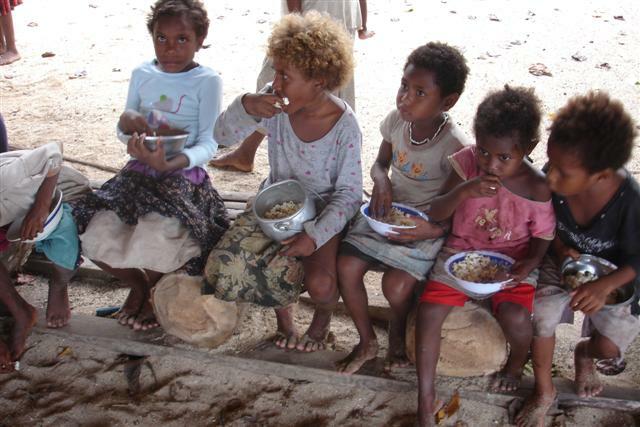 This along with the vegetables from their gardens and the contributions from the boats served up on hand made plates freshly woven from palm leaves made the best welcome feast we have been treated to on our travels. 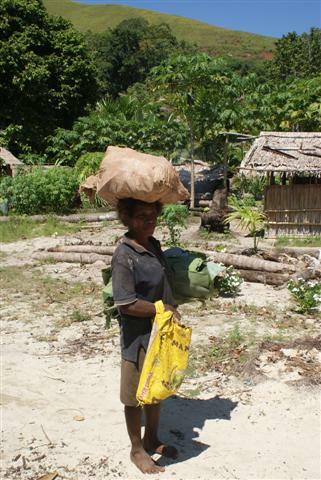 How extraordinary that it should also come from probably the poorest people we had yet encountered. Everyone ate well but the star of the show as far as the kids were concerned was Janice’s popcorn, which they ate in huge volumes for starters. Some of these little girls are wearing tops that Sue had handed out that afternoon and which they were very proud of. 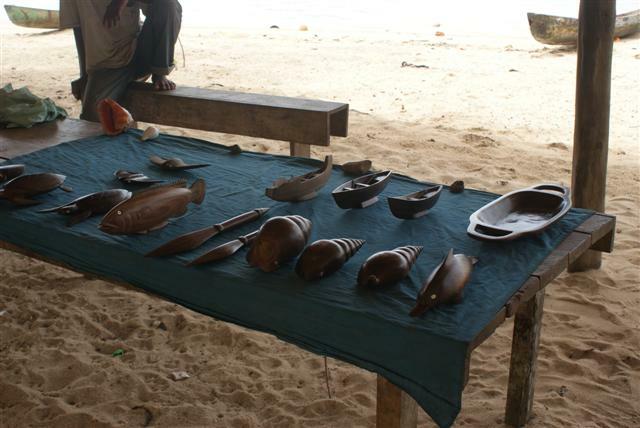 The woodcarvers from a village across the bay set up their stall for us to view and I spent an entertaining hour bartering a head torch, twist drills, hacksaw blades, and a few Solomon dollars for some carvings. We choose a wooden shell and a war club, not sure if we’ll get them past the Australian customs. My knee had improved enough now to take a walk to the end of the next village so we trekked off into the bush only stopping to admire the work of a local man building his home from materials straight from the surrounding jungle, and wonder at the heaps of coral on pyres of logs being prepared to burn down into the lime dust taken by beetlenut users to intensify their hit. Hmmm. Sue ventured further afield with Janice to visit the chief in the next village and we also received a visit on board Camomile from Ben the paramount chief of the area who wanted to show us the DVD he had of the recent festival at Roderick bay. It turned out that Lillian and the brothers had not seen this recording either so we all piled below to watch it on Janice’s PC. All thought our home really lovely. It’s amazing to think they don’t have anything like the facilities we have on board. I noticed when we were visited by Lillian and some of the kids that they spent almost as much time bailing as they did paddling so offered to do something about it. They hauled their canoes out of the water for a couple of days to let them dry out and then I set about them making repairs to the sizable holes that had eroded their way through the wood of the aging craft. Sue discovered that Lillian had a hand controlled sewing machine and a little bit of fabric but no patterns. She spent an afternoon with her tracing patterns onto some thin card that Lillian had and cutting them out followed by instructions on how to use them. It felt good to help and it was well received by the village whom by now felt like really good friends. We snorkelled the surrounding lagoon and among the myriad of smaller fish we spotted a grouper, as large as he looked grumpy, the first we’ve seen and some small string rays. All this time I had been downloading GRIP files from the SSB and keeping an eye on the weather systems careening up the eastern seaboard of Australia, our next destination. It became clearer that we should move off before the tougher November weather set in and after 12 days in this beautiful place we said our sad goodbyes and headed back off to the armpit of Honiara to check out ready for the 1,100 mile beat to the shores of the first continent we would landfall since arriving in Panama from the Caribbean. We will be sad to leave the south Pacific after 2½ years. During that time we have visited some stunning places, stopping at many islands, and met some wonderful people from different civilisations whose generosity has been very humbling. At times I’ve been a little nervous when the boat has been approached by dug out canoes or small launches but that’s soon dispersed when faced with welcoming, happy smiling faces, particularly on the children. This little chap is sitting on the washing and the washing-up!! Most of these people have no hope of having any thing like the sort of life styles we take for granted but do you know, they don’t seem to miss it one bit, they are so rich in their surroundings. The freedom they enjoy is so liberating and I’m not sure which one of us are the lucky ones. 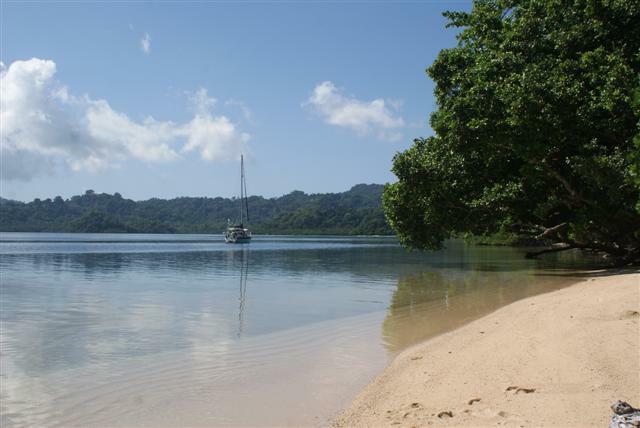 Posted on October 11, 2012, in Circumnavigation, Coastal cruising, Port posts, Redgrove, Sailing, sailing adventure, travel, Westerly, Westerly Sealord and tagged faces of south Pacific, Rodrick bay, Solomon Islands. Bookmark the permalink. 2 Comments. Really fantastic post, one of my favourites.